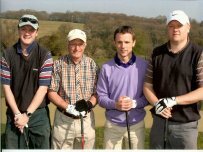 Presteigne St Andrews FC held a highly successful golf day at the Herefordshire Club at Wormsley on Friday 23 April. The event was designed to raise money for both club funds and our chosen charity – Help for Heroes. In the end, it proved to be something of a ‘home victory’ for CP Llanandras as the winning team was made up of Mark Ammonds, Mike Ammonds, Danny White and Chris Ammonds. Organiser Tom Ammonds felt the event had clearly benefited from being staged on one of the warmest days of the year so far. “It was really good and everyone really enjoyed it although the weather made a huge difference to the way everyone felt,” he said. “I was disappointed because I finished sixth – one place out of the prizes, but that’s the way the world goes. “93 points won it which is a very good score in this format – I clearly picked the wrong team to play in!” he added. Adie Bennett, Neil Bennett, Tony Gwynne and Adam Phillips finished second on 92 points, but 50 points on the back nine won them that second prize. Tom said it was a really competitive competition throughout with some excellent scoring across the board while he and his fellow organisers are still calculating the total amount raised. “Financially I am not quite sure where we are – we were aiming for 40 teams but we lost a few due to a large funeral which was totally understandable,” he said. “But we are looking at around £600-£700 each for the charity and club funds but that will depend on what we make from the auctions. “The winners of the Twos competion were Robbie Williams, Neil Bennett and Sam Lloyd who won six golf balls each. “In other prizes, Isiah Lloyd from Rhosgoch won nearest the pin and Adie Burton won the longest drive prize,” he added. Presteigne St Andrews FC would like to thank Tom Ammonds, Andy Crowe and everyone else involved from the Supporters Club for organising what was clearly a highly successful event. We will post final figures of the amounts raised when the number crunching has been completed.